If you’ve been injured during a fall, call this Fort Lauderdale Faulty Handrails and Stairwells Accident Lawyer at 954-448-7288. Falls can occur for any number reasons. One place many falls occur is in stairwells of apartment complexes, condominiums, hotels, motels, resorts and business establishments. One reason a fall can occur in a stairwell is as the result of a faulty handrail or the lack of a handrail. A person may attempt to grab a handrail in a stairwell, only to fall when the handrail either breaks/malfunctions or there is no handrail. There are various building codes that regulate whether or not a stairwell (or any set of stairs/steps, for that matter) require a handrail. For example, staircases with more than three steps may require a handrail. These building codes include The Florida Building Code. They also include the Life Safety Code. If you’ve experienced a fall in a stairwell, staircase or steps due to a defective handrail or the lack of a handrail, Mr. Quackenbush will most likely hire a building code expert. Such an expert will likely evaluate the stairwell, staircase or steps to determine if the area was “up to code.” If the expert determines that the stairwell, staircase or steps weren’t up to code, then he or she can testify to this fact in court – and this will help your case. Call Mr. Quackenbush if you’ve been hurt due a fall in a stairwell, staircase or on steps anywhere in Florida (including Miami, Miami-Dade County, Palm Beach County, and West Palm Beach). This Fort Lauderdale Faulty Handrails and Stairwells Accident Law Firm can be contacted at 954-448-7288. Mr. Quackenbush will discuss with you all aspects of your case for free. If you’ve been injured after falling down stairs or steps due to a defective handrail or the lack of a handrail, your case will be against either the landlord or tenant of the property where you fell. Your strongest case may be against the landlord. This is because, in a landlord-tenant relationship, it is typically the landlord that is responsible for making repairs to the property (including to defective handrails). However, you may also have a case against the tenant (for example, a business owner) if it can be shown that it was actually the tenant that had the responsibility for making such repairs. You may be able to show this using the lease documents between the landlord-tenant. Further, if the building where you fell was constructive with a defective handrail, you may be able to pursue a case against the contractor that built the building. However, pursuant to the “Slavin Doctrine,” you will only be able to do so if the defective handrail was “latent” (i.e., not obvious). After all, if the defect was obvious (i.e., “patent”), then the building owner should have noticed it when the construction was complete and the building was “turned over” by the contractor. If the building owner notices the defect and accepts the building anyway, the building owner (rather than the contractor that did the construction) becomes responsible. If you’ve fallen due a faulty handrail or the lack of a handrail in a stairwell, staircase or on steps, you should attempt to retrieve video surveillance of the incident. Stairwells frequently have surveillance cameras for security reasons. Therefore, your fall may have been captured on this footage. If your fall was captured, it’s important to retrieve it as soon as possible. After all, many of these surveillance cameras are on “loops.” This means that they tape over themselves every so often (i.e., every 3 days, every 10 days, every 30 days, etc.). If you don’t retrieve the surveillance footage as soon as possible, it may be lost forever. If you hire Mr. Quackenbush as your attorney, he will likely send a “preservation letter” to the place where you fell. This preservation letter instructs that entity to “preserve” and not get rid of or alter the surveillance tape. If that entity does so, there can be drastic consequences in court. 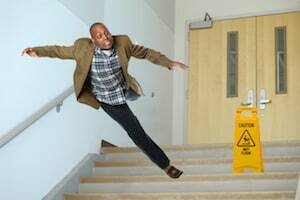 Frequently, the lack of a handrail can contribute to the fall of a person who is already in the process of falling. That is, a person who loses his or her balance may reach for a handrail only to realize that there is none – and the fall can occur as a result. In this case, the defense may argue that the fall was actually your fault. After all, if you weren’t falling to begin with, the handrail would have been irrelevant. This is referred to as a “comparative negligence” argument. The defense will argue that you are comparatively negligent, meaning at least in part at fault yourself. If your case goes to court, the jury will be asked to divide up percentages of fault (i.e., 50/50, 90/10, etc.). Whatever amount of money you are awarded by the jury will be reduced by your comparative fault. For example, if the jury awards you $100,000 but thinks you were 10 percent at fault yourself, you will receive only $90,000 (rather than the full $100,000). Should you be hurt due to a fall caused by a defective handrail in Broward County (including Coconut Creek, Cooper City, Coral Springs, Dania Beach, Davie, Deerfield Beach, Hallandale Beach, Hollywood, Lauderdale-by-the-Sea, Lauderdale Lakes, Lauderhill, Lighthouse Point, Margate, Miramar, North Lauderdale, Oakland Park, Parkland, Pembroke Pines, Plantation, Pompano Beach, Southwest Ranches, Sunrise, Tamarac, West Park, Weston and Wilton Manors), contact Mr. Quackenbush at 954-448-7288. He will talk to you for free.